It’s just NOT summertime until we’ve made up a BLT ( Bacon Lettuce Tomato ) Sandwich. In this post, I share some important notes on creating the best BLT ever in Tomato Sandwich 101. This may just be the EASIEST recipe ever! I started making these when I was a kiddo just barely old enough to use a knife. Nothing like grabbing a fresh hearty tomato out of the garden and slicing it up for a BLT. Back in the day, I would toast up cheap white bread, spread some mayo on it and sloop that juicy tomato in the middle for a yummy snack. Today, we get fancy and use whole wheat bread toasted, herb blend mayonnaise and select organic veggies. Either way, the tomato sandwich has got to be the easiest recipe every recorded. 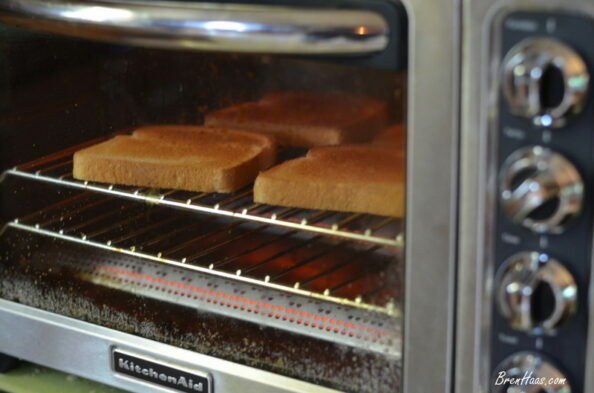 Toast 4 pieces of buttermilk bread in toaster oven. Slice up your favorite garden ripe tomato. I recommend beefsteak or large brandywine variety. Prepare Bacon. I recommend using the precooked bacon for quick and easy cleanup. 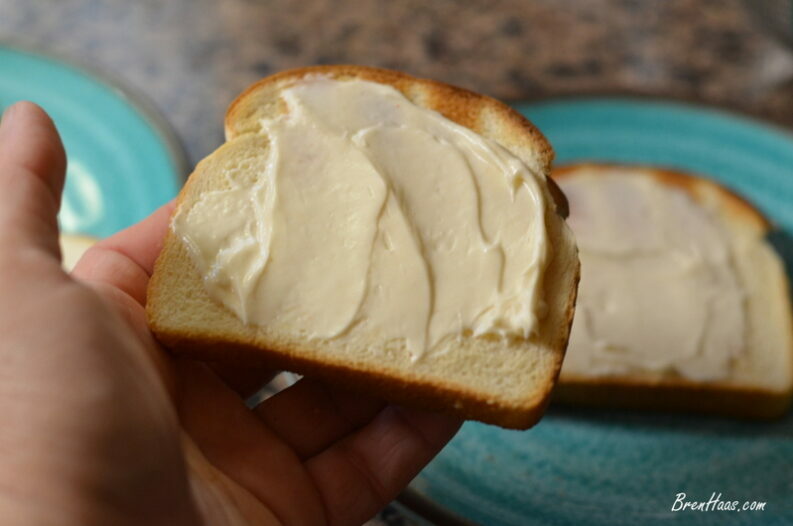 Apply spread to sandwich. Miracle Whip can be used for less calories. Put together sandwich starting with sandwich spread, tomato slice, lettuce and bacon. The Tomato in the image above is the first large fruit I don’t mind eating right off the vine. Read more about the tomatoes I grow on my website. Feel free to share this infographic on Pinterest or other social media sites. Collection of Images to show you the process of making this amazing sandwich. I highly recommend using precooked bacon. I get mine from Costco. The reason I love that bacon is that I’ve waited long enough for my tomato I don’t want to waste any time getting it on my dinner plate! hmmm… I am thinking about adding bacon to my Buffalo Chicken Dip Recipe. Let’s Put The Sandwich Together! 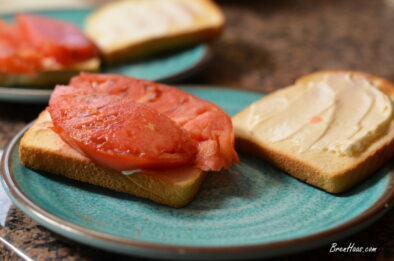 One of my favorite tomatoes to use in a BLT sandwich is the Beefsteak type tomatoes. These tomatoes are large-fruited types, producing a tomato slice that easily covers the BLT sandwich. These are usually late to ripen, so plant some standard-sized or early tomatoes if you crave a BLT early in the season. I shared more about the Beefsteak in this video featuring my raised bed garden. You can find out more about tomatoes I grow on my website. 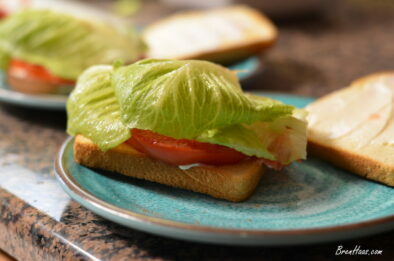 I actually used my Nikon D7000 and took a complete photo collection while making this BLT. Check it out and feel free to comment on the photos if you are a member of the Flickr community. …..and don’t forget the fired OKRA to go with those green mators! We add onion and sometimes a slice of avacado to ours. The best summer sandwich ever!! That sounds super yummy Debbie! I might have to try those additions on the next sandwich. Thank you for commenting! Hello, just doing some research for my site. Truly more information that you can imagine on the web. Not what I was looking for, but good site. Bren, some days I want a BLT, but other days just a plain tomato sandwich. 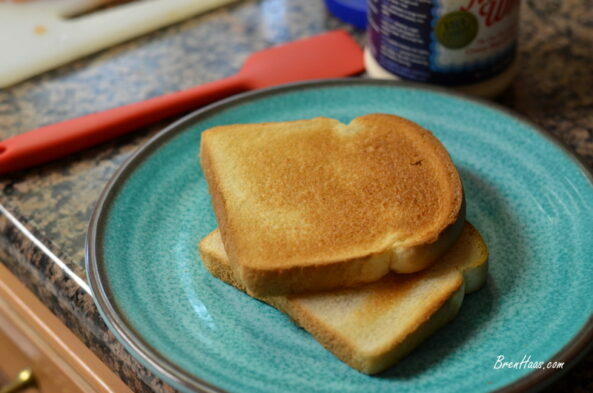 With perfectly toasted good white bread, good mayonnaise (slathered on, as in your photos! ), perfectly ripe tomato and just a light sprinkling of salt and pepper. I hear ya… bacon is overrated sometimes. If you have a really tasty good tomato nothing else is needed. Thank you for stopping by Jean.